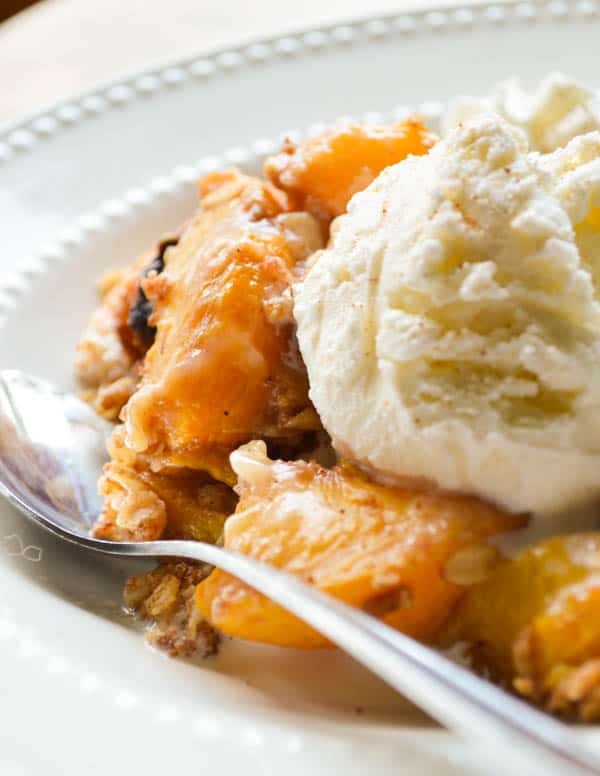 Slow Cooker Boozy Peach Cobbler is best served warm with a scoop of vanilla ice cream. 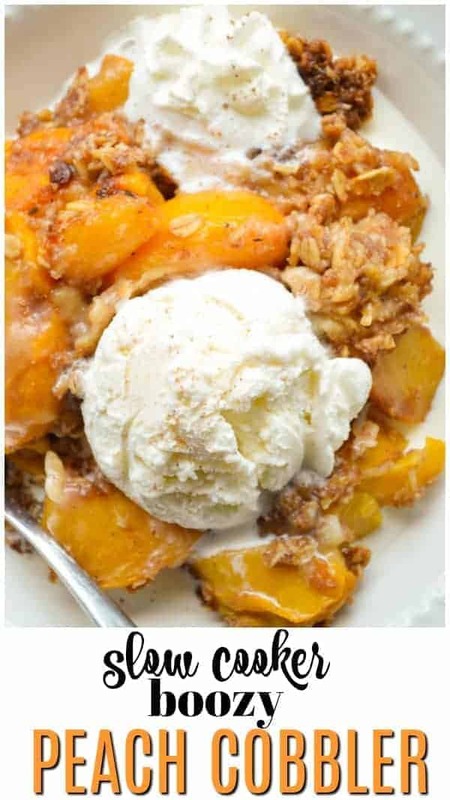 Made with spiced rum, fresh peaches, and a tasty oat topping! Perfect for serving a crowd. You guys. We made it through the ENTIRE summer without talking about hoarding produce and then trying to figure out what to do with it. 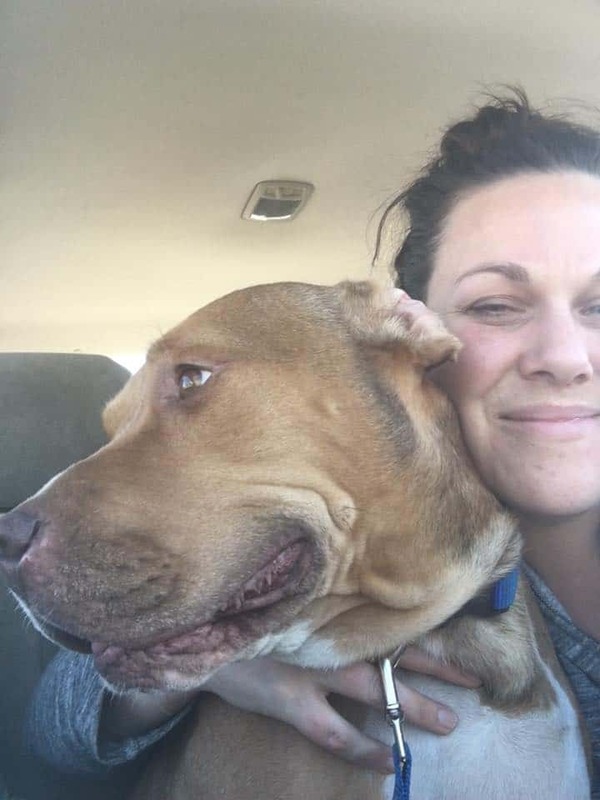 Side note: HOW. howhowhow is it September?! Anyway. 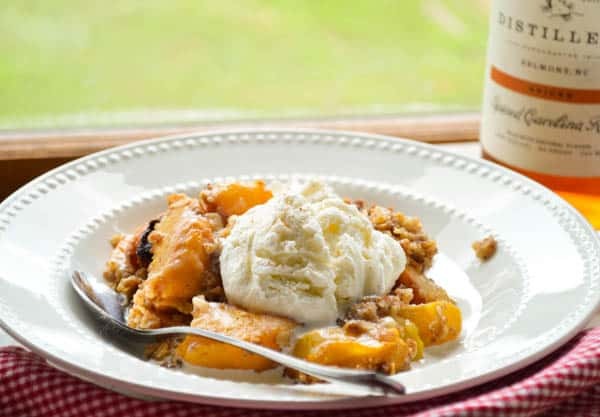 I am making up for lost time starting today, with the 1/2 peck of peaches I bought, and this Slow Cooker Boozy Peach Cobbler. 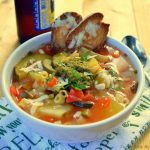 This recipe is PERFECT for feeding a crowd. You can throw everything in the slow cooker and forget it for a couple of hours while you do other things (like grill chimichurri chicken). I based this recipe on an oldie but a goodie, my Slow Cooker Blueberry Coconut Cobbler. It’s still made with cake mix (yessss – FROM A BOX) but this time I added rum. Spiced Rum! From a local distillery. These Spiced Rum Cupcakes with Boozy Buttercream are ALWAYS a hit because it lends the perfect amount of sass to dessert. You can also go with bourbon here. Peaches and bourbon are definitely friends. Use what you have! 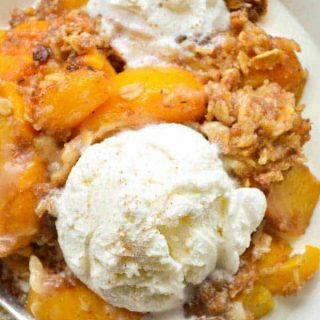 But if you are running to the liquor store JUST to make Slow Cooker Boozy Peach Cobbler, get the spiced rum. From Muddy River Distillery. If you are in the Charlotte, NC area, GO TO the distillery. It’s run by a couple and they are extra cute. You can save your shot glass and go back for free tastings whenever you like. 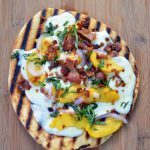 This is a set it and forget it kind of recipe that’s great for feeding a crowd. 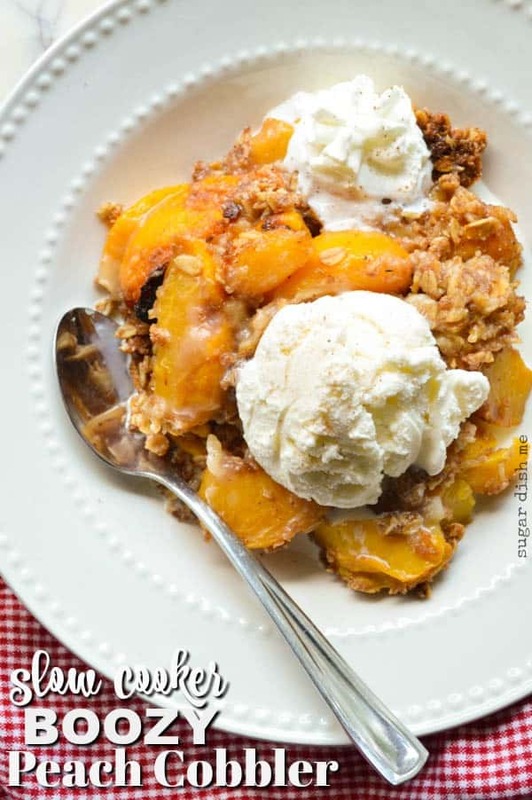 If you are having a cookout, attending a potluck, or just want to have some dessert without making your house too hot (it was 91° here today, y’all. 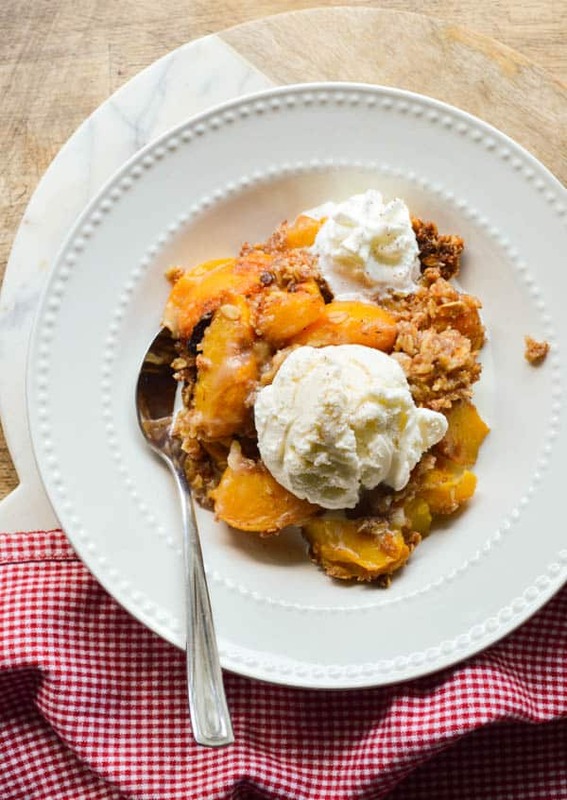 WTH, September), Slow Cooker Boozy Peach Cobbler is perfect. This is also a SUPER easy recipe to double. Labor Day weekend is here! Let’s say goodbye to summer with peaches and rum. Got Peaches? 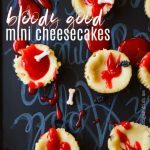 I’ve got recipes! 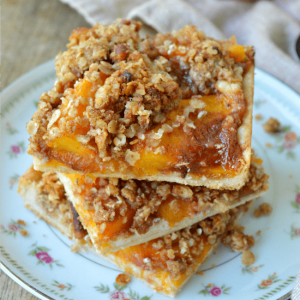 Peach Crumble Pie Bars are GOOOOOOOD. It’s a sheet pan dessert you’ll adore! 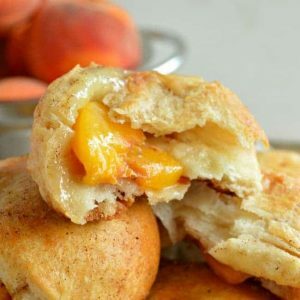 Peach Pie Biscuit Bombs are a Sugar Dish Me reader fave! Made with refrigerated biscuits. I love a good shortcut. 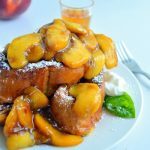 Toss the peaches with the spiced rum and then coat with 1/4 cup of the cake mix. 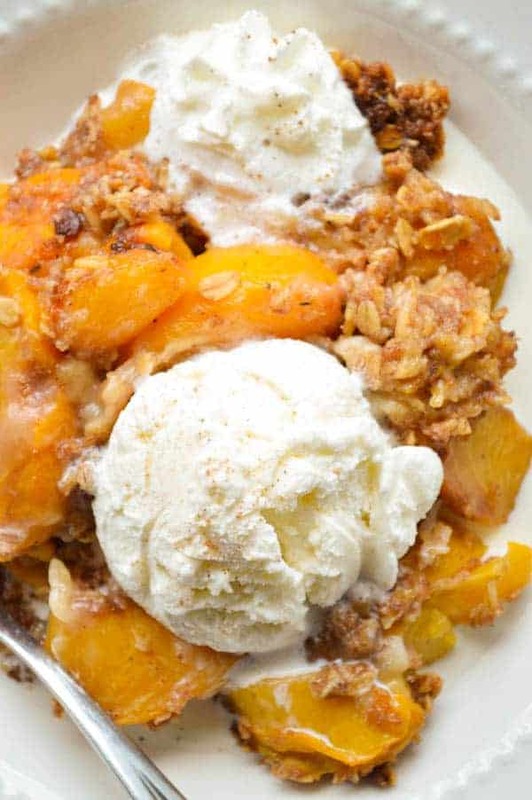 Add the peaches to your slow cooker. In a medium bowl, combine the remaining 3/4 cup cake mix, the oats, brown sugar, cinnamon, nutmeg, and allspice. Cut the butter into the mixture until coarse crumbs form (I use a box grater to cut in the butter and then mix with my fingers). Cover the peaches with the crumbly mixture. I would recommend old fashioned oats for this recipe. You could use quick oats if that's what you have on hand, but I'm not sure the texture will be quite as crisp/crumbly on top because quick oats are ground. You can go lighter on the rum if you don't like a heavy rum flavor. This looks so delicious! It’s on my list to make.